Based on customer specifications, we deliver repair clamps and couplings for pipes. 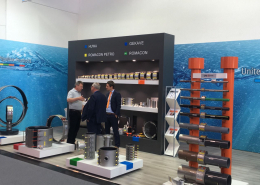 Our products meet all current standards for drinking water, gas, oil pipelines and recently also in the petrochemical pipelines onshore and offshore industry. The products from the UNI-Cou­pling Line are very interesting for the shipping, construction and other industries. With certificates such as ABS, DNV GL, LR, ISO 9001:2008 and ISO 14001, our customers can rest assured that we produce according to international regulations and work. For the repair clamps we only use high quality stainless steel and rubber. The threaded outlets and flanges are available in all international standards. For more information on the different companies within the holding you may have a look at our corporate website.